The NBA Playoffs don’t begin until Saturday afternoon, but so many people have already given up on the Boston Celtics. They have good reason to doubt Brad Stevens’ squad. Injuries have hit the Celtics harder than any other team in the league this season. Gordon Hayward has been missing since the opening moments of the campaign, and now Kyrie Irving’s knee has forced him to be shut down until next year. Luck hasn’t been on the Celtics’ side all season. Could the playoffs be a different story? It has been nailed on for weeks that the C’s would be the 2nd seed in the playoffs, but until yesterday it was unclear who their first opponent would be. Now we know they’ll be playing the Milwaukee Bucks in the opening round, and that’s a relief. The Washington Wizards late-season collapse was worrying as it could’ve seen them paired with the Celtics as the seventh seed. Washington and Boston have history going back to last year’s playoffs, when a very different looking Celtics team beat them in seven games. Scott Brooks’ squad responded this year by winning three out of their four contests with the C’s. Kyrie was only available in one of those games, but the John Wall-Bradley Beal-Otto Porter triumvirate represents more talent than the Heat or Bucks possess on their entire roster. Miami seemed like the slightly preferred opponent for one reason; they don’t have Giannis Antetokounmpo. Giannis will be the Celtics’ main obstacle in this first round series. He is genuinely a freak. He’s tall, quick, long, athletic, and is starting to get better at knocking down jump-shots. Boston didn’t have anyone who could guard him a few weeks ago when they fell 106-102 in Milwaukee, but at some point this series they’ll get their lock-down defender back. Marcus Smart’s rehab from thumb surgery is ahead of schedule, and he now looks set to return to the fold at some point during the first round. If Smart was available for that close loss in Wisconsin a few weeks ago, Boston would’ve probably gotten the victory. 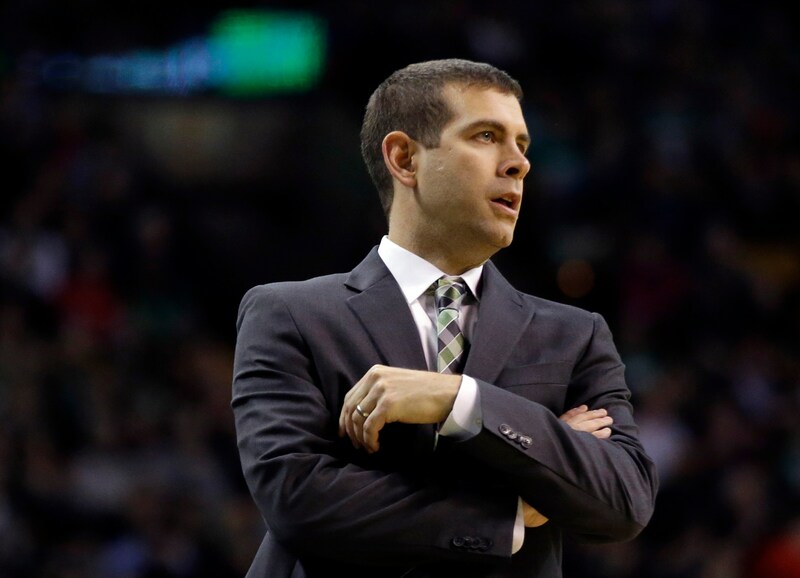 If the games were decided by coaching alone, the Celtics would be the favorites in the Eastern Conference, and they’d be looking at a sweep in this opening series. The Bucks fired Jason Kidd midway through the season, and Joe Prunty has since taken over as the interim head coach. Prunty is better than Kidd, which isn’t saying much, but he’s still light-years behind Brad Stevens. The Bucks’ defensive scheme is particularly vulnerable to good coaching. It revolves around blitzing and trapping, and it’s easy to beat with decent offensive spacing and ball movement. Milwaukee is letting opponents shoot 37.2% from three this year. That’s the fifth worst rating in the league, which is even more damning when you consider how much of their team is made up of players with long arms who shouldn’t struggle to get hands in the faces of shooters. They simply give up way too many open shots. They also lack the strong interior defense that has killed Boston at times this year. Al Horford has struggled when he has had to face players like Andre Drummond, Anthony Davis, and Steven Adams. He won’t struggle against John Henson or Tyler Zeller. Giannis is their best interior defender, and he’ll likely spend most of his time guarding Jaylen Brown or Jayson Tatum. If the Celtics do get past the Bucks they’ll face either the Heat or the Philadelphia 76ers in the next round. Philly finished the season as the hottest team in the league and would deservedly be the favorites, but the Celtics would still have a better chance against the Sixers than against the unstoppable entity that is Lebron James in the playoffs against Boston. On paper, it looks like the draw has been kind to the Celtics, but they would still be unwise to look past the Bucks. Luckily, Brad Stevens is incapable of letting his teams underestimate an opponent. Injuries will probably keep them from getting as far as the NBA Finals, which would’ve been their ceiling with a healthy Gordon Hayward and Kyrie Irving, but this Celtics team has fought against the odds all season long. Don’t be surprised if they have another surprise up their sleeve and find their way to the Eastern Conference Finals. Next articleTake Me Out to the Ball Game! Red Sox Opening Day 2018!